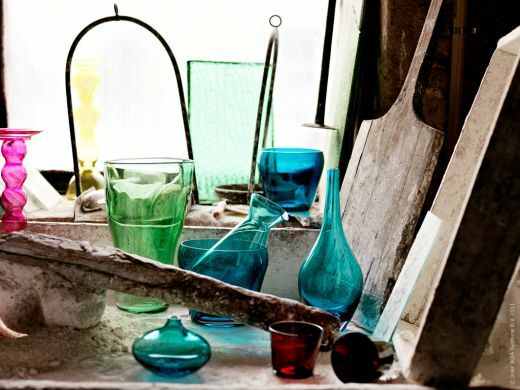 Colored glass. Could it get any better on a Friday? These pieces are beautiful. We have a few pieces of colored glass around our house. Mainly in blue or aqua. We were going for some kind of color scheme at some point on our lives…but we ended up having the most random house known to man. But our blue pieces end up pulling everything together, and making it look somewhat unified. I really love the pink candle holder, and the green vase. We have a recycled green glass appetizer server, and that is pretty great too. I think I need to work in glass. I mean, how cool would that be?